From the early years of its European settlement, the coastal shores, waters and weather of New Jersey became known for their hazards to shipping. Indeed, the first European woman believed to settle in the colony, Penelope Van Princis, a native of Amsterdam, was shipwrecked in 1640 off Sandy Hook and struggled ashore near the present-day Highlands, where her husband was murdered by Lenni Lenapes and she was brutally slashed and left for dead. After hiding for several days and tending to her wounds alone, she was discovered by other Native Americans, who cared for her, nursing her back to health and ultimately taking her by canoe to the Dutch town of Nieuw Amsterdam. Four years later, Penelope married Richard Stout, an Englishman, and after coming to New Jersey the couple would begin a family whose descendants, estimated at some 500, would become one of the most prominent families of Monmouth County into the current century. In 1764, more than a century after Penelope Van Princis was shipwrecked, the colony of New York built the first lighthouse at Sandy Hook, financing its construction from a lottery and recognizing the importance of safer passage for shipping using its thriving port at New York Harbor. As the New Jersey colony grew, shipping became the preferred choice for travel, not only to and from abroad but also for conveying people and goods to nearby colonial ports and settlements, compensating for the rudimentary paths and roads within the colonies. Following the Revolution, the new federal government made one of its first priorities the construction of lighthouses to aid ships to navigate safely along the shore and to and from emerging ports. Originally lit by open fires and later candles, the lights evolved in the 18th century to use whale oil and then kerosene, with the keeper responsible for maintaining the flame, cleaning the lens and occasionally issuing alerts of foundering ships and even conducting rescues. In the early 1800s, the technology of lenses improved with the introduction of the Fresnel (pronounced fray-nell) lens, developed by the French engineer Jean-Augustin Fresnel, which allowed stronger illumination through smaller beehive-shaped lenses fitted into more compact spaces. Weights were used to drop down the tower shaft to drive gears that caused the lens to revolve; after the weights descended to the bottom of the tower, the keeper hand cranked them back to the top for a new descent. 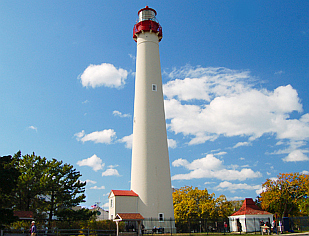 Visibility of the light improved as acetylene gas as a fuel came into use in the 1900s, with the Cape May Lighthouse in 1934 becoming the first in the nation to install a sodium vapor lamp. By World War I, there were some 40 light stations-- lighthouses, lightships and range lights--along the 130-mile New Jersey coastline. As more sites converted to electricity or gas with automated lamps that turned on at dusk and shut off at dawn, several lighthouses dispensed with keepers. During World War II, lights were turned off to prevent their use as a navigation aid by German U-boats, but most lighthouses continued to be staffed by their keepers or civil defense members, who would use telescopes and binoculars to scan nearby waters to guard against potential U-boat attacks or landings by spies, as well as watching for friendly shipping that appeared to be in distress. More recently, lighthouses were taken out of service as radar and global positioning satellites allowed ships to improve their own navigation and knowledge of their position. In 2000, the federal government encouraged state and local governments and nonprofit groups to assume control and conservation of deactivated lighthouses with the enactment of the National Historic Lighthouse Preservation Act of 2000. Today, eleven New Jersey lighthouses, several maintained by the state or nonprofit conservation groups, are open for public visits. 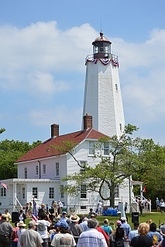 The nonprofit New Jersey Lighthouse Society, with its focus on the New Jersey, Delaware Bay and New York Harbor regions, is one of the largest regional lighthouse societies in the United States, promoting appreciation of the history of lighthouses and supporting their preservation. The Coast Guard currently maintains a fleet of fourteen 175-foot Keeper Class Buoy Tenders to service the remaining lighthouses and lightships in operation. 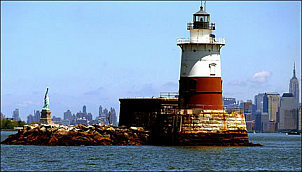 One of those ships, the Katherine Walker with its home port in Bayonne, is named for one of the few women to have served as a keeper, who after her husband's death in 1890 succeeded him as keeper of the Robbins Reef Light Station offshore of Bayonne, raising two children and maintaining the light (known to many as 'Kate's Light') for some thirty years. First lit in 1857, constructed with aid of federal appropriations of some $52,000 initiated at the behest of Dr. Jonathan Pitney, the "father of Atlantic City." Decommissioned in 1933, placed on the National Register of Historic Places in 1971. 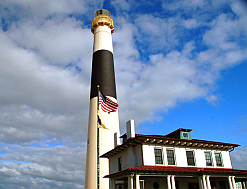 New Jersey's tallest lighthouse and the country's third tallest masonry lighthouse, features original first-order Fresnel Lens still in place, two-acre property with outdoor exhibits, a Keeper's Cottage, museum and gift shop. Located at northern end of Long Beach Island in Ocean County. Original lighthouse began service in 1835 built with appropriation of $6,000 from Congress, beach erosion impacting site forced construction of new, much taller lighthouse on nearby site commissioned 1859. 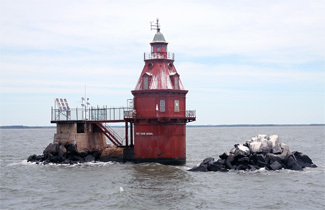 Lighthouse supplemented commencing in 1904 by Barnegat Lightship moored 9 miles offshore until ship decommissioned in 1967 (now docked at Penns Landing in Philadelphia). Lighthouse deactivated January 1944 and given to state government. 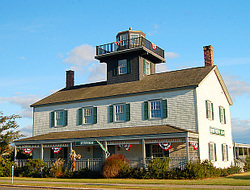 Several blocks away is ﻿Barnegat Light Museum﻿ operated by Barnegat Light Historical Society which houses light's original first-order Fresnel lens and other related exhibits. 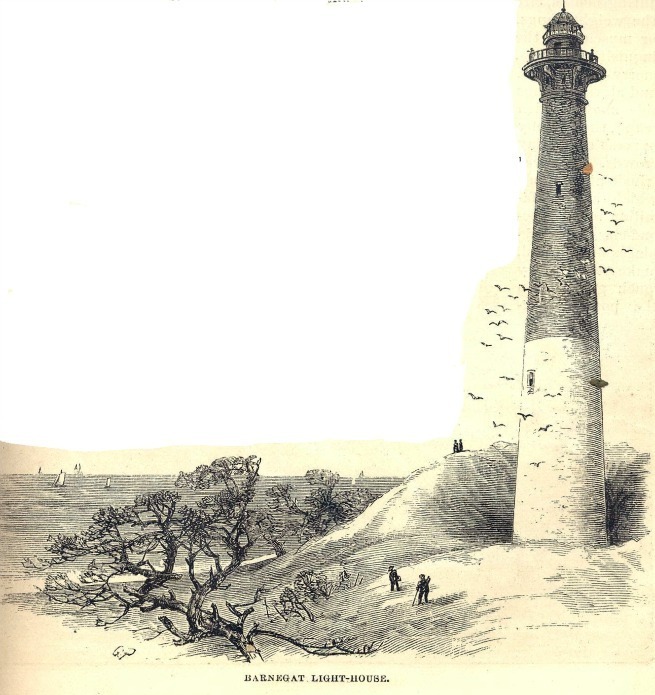 Barnegat Lighthouse shown in drawing in issue of Harper's Weekly published in December 1876. Still operated as aid to shipping with automated lamp at top of 157-foot tower visible 24 miles out to sea which flashes every 15 seconds. Built in 1859, replaced original lighthouse which began operating 1823 and second lighthouse built 1847, both of which closed due to erosion at base. In 1934, became first lighthouse in nation to install sodium vapor lamp. Leased by Coast Guard to nonprofit Mid-Atlantic Center for the Arts & Humanities in 1986 which raised funds for restoration, acquired by state government 1992 and located within Cape May Point State Park. Commenced operation 1849 at mouth of Maurice River on Delaware Bay in Cumberland County, known for many years as Maurice River Lighthouse. Light automated 1911, decommissioned by Coast Guard 1941. Severely damaged by fire 1971, restoration begun by Maurice River Historical Society with aid of federal and state funds new lantern and roof installed. Open to public on 3rd Sunday of month from April to October and for other special events. Current site threatened by encroaching waters of bay, shore now less than 120 feet from structure, down from 174 feet in 2008. Site on south side of Hereford Inlet in Cape May County, which leads from Atlantic Ocean to Intra-Coastal Waterway linking Maine to Florida. Shoals and strong currents at Inlet resulted in frequent shipwrecks, leading to establishing Life Saving Station in 1849, replaced in 1871 by larger station at same time of US Life Saving Service. Congress approved funds to build lighthouse which was was completed in 1874 and designed by Paul J. Pelz, who designed other lighthouses and also Library of Congress in Washington D.C. Tower with lamp 57 feet above sea level, light visible at distance of 13 nautical miles. Severe storm in 1913 significantly damaged foundation, forced relocation to current site 150 feet west. Light automated 1964 placed on iron skeletal tower behind original Lighthouse. Federal government transferred property to state, which subsequently leased site to City of North Wildwood and after restoration re-opened for public visits in 1983, with light re-installed as functional aid to navigation. Features museum with exhibits including original Fresnel lens. Listed on both National and State Registers of Historic Places, operated and maintained by non-profit The Friends of Hereford Inlet Lighthouse Inc.
Finns Point named in recognition of 1600s Finnish settlement. Construction of lights authorized by Congress in 1875 appropriating $55,000 for two pairs of range lights to help vessels travel from Delaware Bay into Delaware River passing between Reedy Island and Baker Shoal. 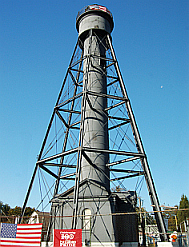 Operated on 94-foot wrought iron tower from 1877 until 1933, when keeper replaced and in 1938 automated beacons installed, deactivated permanently in 1950. Local volunteers raised private funds along with US Fish and Wildlife Service contract to restore and paint tower, added to National Register of Historic Sites in 1978. Public visits, after suspension for lack of funds in 2006, resumed in 2013. Located near Fort Mott State Park and Finns Point National Cemetery. Located offshore of Bayonne between New Jersey and Staten Island near entrance to Kill van Kull waterway linking Upper New York Bay to Newark Bay, marked reef which had been hazard to ships using New York Harbor. Built with $50,000 appropriation approved by Congress, commenced operation 1839. Tower included five rooms for keeper and family, with kitchen and sitting room on first level, bedroom on second level, and two bedrooms on third level. Fresnel lens installed 1855 to replace original array of several lamps. Light and original tower replaced with new structure erected in 1883. Also known as 'Kate's Light' honoring Katherine Walker, who became keeper (at four feet, ten inches tall and 100 pounds in weight) for nearly 30 years after husband's death in 1890. In addition to assuming her late husband's duties in maintaining the light, she rowed her two children to school each day and was credited with the rescue of 50 fishermen and sailors wrecked or stranded on the reef and in nearby waters. When the Coast Guard assumed operation of the light in 1939, it maintained a three-man crew performing the tasks once completed alone by Kate Walker. 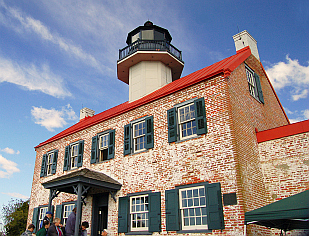 After deactivation, the lighthouse was offered at no cost under the authority of the National Historic Lighthouse Preservation Act of 2000 and transferred in 2011 to the nonprofit The Noble Maritime Collection, which plans to renovate the tower’s lower level into a museum for tourists and school groups and operate its upper floors as a bed-and-breakfast. Oldest surviving lighthouse in US, first lit on June 11, 1764, celebrated 250th anniversary in 2014. Originally built by Colony of New York with proceeds from a lottery to guide ships passing by Sandy Hook on way to and from New York Harbor. During Revolutionary War, seized by British in 1776 and held through end of war in 1783. Fresnel lens installed 1857, in 1899 becomes first lighthouse in US to use electric incandescent lamp. Continues to be operated by Coast Guard as working lighthouse. Lighthouse Keeper's Quarters, built in 1883, now serves as museum and visitor center. Located within Gateway National Recreation Area. Situated on high bluff above southern entrance to Sandy Hook, extensive views of New York Harbor and lower Manhattan. First lit in 1828, officially named Navesink Light Station, but soon became known by locals and mariners as Twin Lights for its pair of lamps. In 1841, became first lighthouse in New World to be equipped with Fresnel lens, in 1898 first lighthouse to be powered by electricity. Current brownstone structure built 1862, served as primary seacoast light marking entrance to New York Harbor. Site of demonstration in 1899 by Guglielmo Marconi of Wireless Telegraph using radio waves to transmit news of America's Cup race off Sandy Hook, bluff subsequently used for installation of antennas by Western Union, other wireless communications and radio companies. In the 1930s, importance diminished as improved lightships were deployed to mark approaches to New York Harbor, deactivated by Coast Guard in 1949. Town of Highlands acquired lighthouse and grounds for use as museum and public park in 1954, subsequently transferred to state government, with nonprofit Twin Lights Historical Society founded to operate and staff museum. 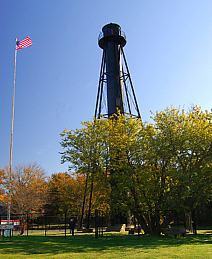 Beacon first lit in December 1896, built to illuminate coast midway between Twin Lights to north and Barnegat Lighthouse to south. Last live-in lighthouse with tower integrated into keeper's living quarters built on Atlantic Coast, brick structure with 44-foot tower. First land-based light station equipped with a radio beacon navigation system, installed 1921 to allow ships to navigate in poor conditions such as storms and heavy fog. Aided crew of liner Morro Castle, devastated by fire in 1934 which caused 137 deaths, to fix position and served as first aid station for survivors. Light extinguished during World War II as military measure, but staffed by Coast Guard lookouts searching for enemy ships and Allied vessels in distress. Original Fresnel lens replaced with automatic beacon after War, in 1954 separate metal tower built on property away from original structure with beacon relocated to new tower. 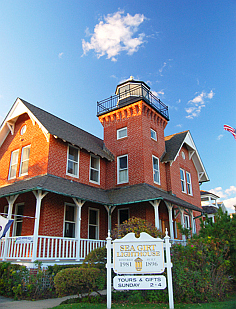 Borough of Sea Girt bought lighthouse from federal government for $11,000 in 1956, used it for over 20 years as public library and community and recreation center, subsequently leased it in 1981 for $1 per year to Sea Girt Lighthouse Citizens Committee, which undertook fundraising for restoration and operation. Features exhibits of historic artifacts, documents, portraits and photos on US Lighthouse Service and its keepers and their families. Open for public tours on most Sundays from mid-April to before Thanksgiving, special tours by prior arrangement year-round. Current structure at Tuckerton Seaport re-creation of original lighthouse first built 1848 some nine miles away on southern point of Long Beach Island on land purchased by Reuben Tucker in 1765. 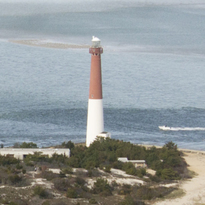 Lighthouse guided marine traffic into Little Egg Harbor, located west of the barrier island, but site became separate island after erosion carved channel between it and Long Beach Island, lighthouse discontinued operation and fell into water in 1927, entire island submerged in 1952. Tuckerton Seaport, located onshore some nine miles from original lighthouse site, features marina, maritime heritage displays and demonstrations of boat building, decoy carving, and basket weaving. Began operation on Delaware River on evening of December 31, 1880, steel skeletal structure standing 85 feet tall with 112 steps. Rear Range Lighthouse works in conjunction with Tinicum Front Range Light (also referred to as Billingsport Front Light) on Delaware River approximately 5/8 mile southwest of rear light. Only lighthouse remains, five-acre site originally included seven-room keeper’s home, brick oil house, frame barn and barnyard, cow shed, poultry house and privy. In 1917, oil light changed to electric, continues in service maintained by Coast Guard. Tinicum Rear Range Lighthouse Society raises funds for restoration, schedules tours and events, but public visits temporarily suspended 2016 while facility undergoes maintenance by Coast Guard. Situated in Delaware Bay some three miles from mouth of Cohansey River in Cumberland County. Named after German vessel John which ran aground on shoal in December 1797 on its way to Philadelphia, with passengers evacuated ashore to Greenwich, cargo unloaded and ship subsequently destroyed by encroaching ice. (Ship's figurehead on exhibit in Gibbon House Museum in Greenwich.) Built in 1870s with $50,000 appropriation from Congress, cast iron superstructure exhibited at 1876 Centennial Exposition in Philadelphia, later installed over foundation on wooden piles driven into the shoal, lit for first time on August 10, 1877. Light automated in 1973, four years later original Fresnel lens replaced by a solar powered beacon. Declared unneeded in 2011 by Coast Guard, auctioned in 2012 under provisions of National Historic Lighthouse Preservation Act of 2000 for winning bid of $60,200.